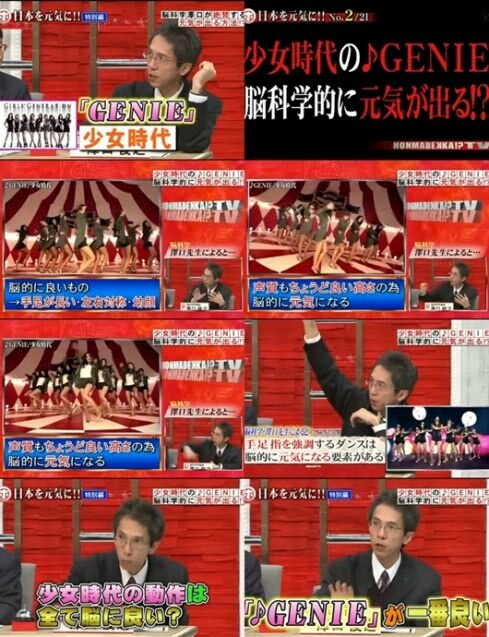 Famous comedians and experts in various fields appeared on a Japanese program aired recently called ‘Let’s Give Energy to Japan’. During the broadcast, Professor Sawaguchi said, “SNSD’s ‘Genie’ from Neuroscience point of view, has the ability to cheer a person up. Because of their long arms and legs and also the perfect synchronicity, watching their performance is good for the brain”. He added, “Also, because of the level of amplitude of their voices suits the brain well, it has the effect to encourage a person”. He further explained, “As most of SNSD’s dance steps involve arms and legs, it also helps one to acquire a clear mind”. After his final answer to the question from the panels about the benefit of SNSD’s dances to the mental health, the professor stated, “However among them, ‘Genie’ is the best for brain growth as well as providing the ‘cheering’ effect”. Netizens who saw the broadcast commented, “When I am depressed, should I do SNSD’s dance?”, etc.